Speri wines? 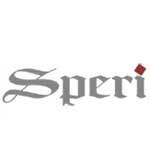 Order Speri wines from Italy easy and safely! One of the historical families in Valpolicella, Speri is an important and faithful exponent of the wines of the Valpolicella Classica zone and has also become, thanks to the firm’s consistency and its intimate links with its area of origin, an authoritative point of reference within the Italian wine scene. The company’s history began in the first half of the nineteenth century, with just a few hectares next to the Speris’ family home. The grapes not only form the basis for a good wine: they give it its essence, its soul, its personality. They adapt themselves to the rhythms of nature, they make themselves at home in the land in which they grow and allow themselves to be guided by the hands of the vigneron. Cultivating the land is an ancient occupation, tinged with tradition and the aura of times past. The Speris began working as vine growers in Valpolicella seven generations ago. Times change but the old values endure, as does the Speris’ pride in being part of an extraordinary area like the Valpolicella Classica zone and the moral duty they feel to express its characteristics in their company’s wines. Over the course of the years, the company has invested in new properties in the top-quality areas of Valpolicella Classica, so that it now owns 60 hectares. Times have changed and the company has grown, but it still remains in the hands of the family, which can now boast of being in its seventh generation. From the vineyard to the bottle we produce wine using exclusively our own grapes and we closely supervise all stages of production, giving great attention to every little detail. Our extensive experience in vine growing and our constant quest to improve quality have given us a particular awareness of tradition and environment. The use of the “inclined open pergoletta” system supports indigenous varieties best and gives them optimum exposure to sunlight, particularly in hilly areas. In order to reduce the yield in the vineyard we use the grassing technique and do not use fertilizers. We weed, prune and thin out on a regular basis. The vines are treated with environmentally friendly products and, by using modern machinery and tools, the amount of phytosanitory products used is very limited. The grapes are hand-picked and carefully selected by experts.